When planted under the right conditions, an orange tree requires relatively little maintenance and produces an abundance of sweet fruit. But, while they are easy to grow, orange trees are susceptible to a few diseases. Fortunately, most of these diseases are nonlethal, especially if identified and treated early. Citrus canker is caused by a highly contagious bacterial pathogen. Infected leaves first develop white, spongy spots with oily rings that eventually turn gray or tan before bursting and forming a canker or crater. These cankers occasionally fall out of the leaf, leaving behind holes. Affected oranges develop yellow, circular lesions or scabs on their rind. Since the disease can be spread by as little as a gust of wind, orange trees are often felled and destroyed to prevent the spread of this disease. 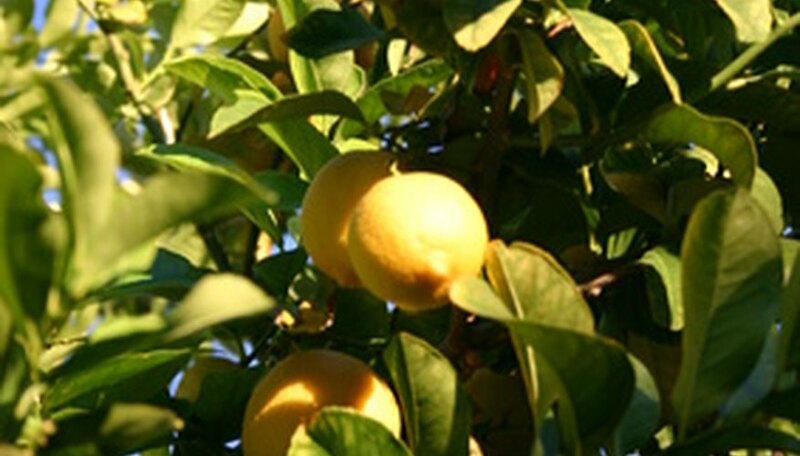 Melanose is caused by a fungus that reproduces on the dead wood of older citrus trees. As the disease progresses, it mars fruit, leaves and small twigs with small dark brown and black spots that are raised and rough to the touch. In advanced cases, melanose can also cause wood rot in stressed or old trees. Although melanose renders fruit unmarketable, it does not mar their flesh or kill the tree. Greasy spot disease is caused by a fungus. Two to nine months after the citrus tree is infected, yellow-brown spots begin to manifest on the orange tree's leaves or fruit. As the disease progresses, the spots turn into oily blisters that protrude from the bottom surface of the leaf. On oranges, greasy spot manifests itself as tiny black spots or pits between oil glands. If left untreated, greasy spot disease can lead to considerable leaf drop. Sooty mold is a black fungus that grows on the honeydew secretions of insects like aphids, whiteflies and mealybugs. Sooty mold does not harm the tree, but significantly covered leaves may lose some of their ability to photosynthesize. Root rot is caused by a moisture-loving fungus often found in water-logged soil. Orange trees afflicted with root rot have brown patches of hardened bark that may ooze sap. As root rot progresses, the bark will dry out and die, leaving a sunken canker behind. The leaves and fruit may also yellow, die and drop. As the disease progresses, the tree will grow poorly and produce less. The symptoms of root rot resemble a number of other orange tree diseases. Therefore it is necessary to have a professional diagnose the disease.